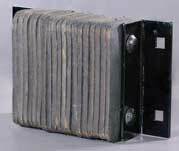 Dock bumpers on this page range from 4 1/2" to 6" in depth. For bumpers over 6" in depth please see the extra thick dock bumpers. Tough plies of truck tire material virtually eliminates chipping or abrasion, unlike molded rubber, extruded rubber, conveyor belting or wood plank bumpers. Anchor bolts are protected by at least 3" of rubber to prevent damage. 4.5" thick x 12" high x 24" wide. 4.5" thick x 20" high x 11" wide. 6" thick x 12" high x 12" wide.